Is four the magic number for Archos? 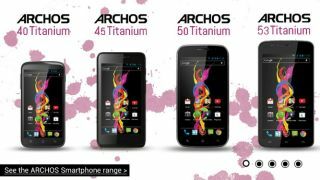 Archos has announced its latest range of latest range of smartphones, pitched at a wallet-friendly price tag. Archos has given them its Titanium branding, with the four devices covering screen sizes from 4 to 5.3 inches. Archos isn't a brand that you'd normally associate with smartphones, with its most recent products being centred around the tablet market. You may have seen or heard about the Archos 80 Titanium or the Archos GamePad 2. That said, some may remember that it announced a range of smartphones back in April. Although the budget market is one of the hottest markets, the spec list leaves little to set the world alight. Then again, when the cutting edge feature may well be price, maybe that doesn't matter. Specs wise, though, all four handsets come with dual SIM capability, a small 1.3GHz dual core processor backed with 512MB RAM, and 4GB storage. Screen wise, the baby of the bunch, the Archos Titanium 40, comes with a 4 inch WVGA 480x800 screen. Also aptly named, the Archos Titanium 45 and Titanium 53 come with 4.5 and 5.3 inch FWVGA 480x854 screens respectively. The Archos Titanium 50 has the highest resolution, a qHD 540x960 5 inch screen. There is no news of release dates or market availability, but prices have been announced at between €100-160 (about £85-135, $135-220, AU$140-225).